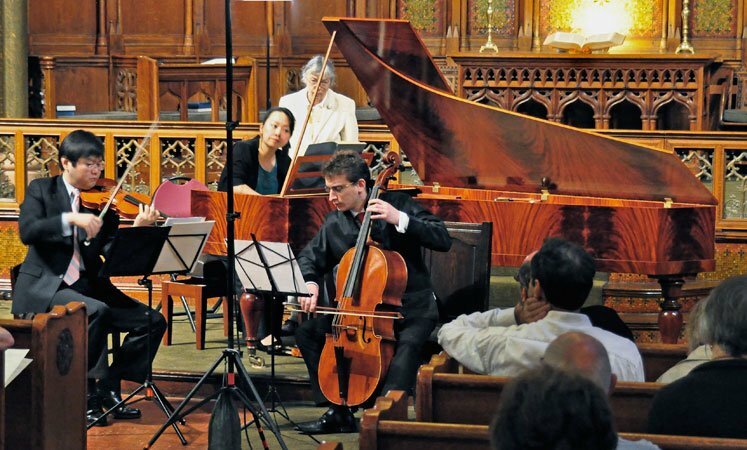 There is resistance within the organizers of the Boston Early Music Festival to presenting music later than the middle or third quarter of the 18th century, the height of the Baroque. In Europe, however, “early” is often now being defined as music written before instruments acquired their modern forms in the late 19th and early 20th centuries. Perhaps no other instrument has changed as much as the piano since its invention around 1700 by Bartolomeo Christofori. For the past two iterations of the BEMF, recording engineer Christopher Greenleaf has created a “Composers & the Piano” series and organized a morning-long Fringe performance focusing on a single late-18th and early 19th-century composer: Schubert two years ago [here] and this year Beethoven. He plans to continue, thinking even of Brahms. Since in this context the star of the show is the piano as much the pianist, details need to be given about the instrument used, and I will give the instrument its due a bit later. Of course, the instrument is useless without good players, and they were in abundance: three pianists, in performing order: Randall Love of Duke University, Stephen Porter of Boston, and Yi-heng Yang of New York City. Yang was joined by violinist Daniel Lee and cellist Ezra Seltzer, both also of NYC, for her portion of the program, which closed the first half. A 15-minute interview session conducted by Greenleaf followed the Intermission. Yesterday’s program at Boston’s Church of the Covenant opened with Love’s performance of the Sonata No. 30 in E Major, Op. 109, composed in 1820. Porter followed this with the (10) Bagatelles, Op. 119, begun in the 1790s and completed and published in 1822. The chamber works followed, first two unpublished trio movements: Triosatz in E–flat Major, Hess 48, composed ca. 1790-92, and Triosatz in B-flat Major, WoO 39, composed in 1812; followed by the Sonata No. 10 in G Major for piano & violin, Op. 96, also dating from 1812. The second half of the program featured Love playing the Sonata No. 27 in E Minor, Op. 90, written in the summer of 1814 followed by Porter playing the last Sonata, No. 32 in C Minor, Op. 111, written in 1823-24. It’s always difficult to know what to say about performances when they are so fluent, fluid, masterful, crisp, and precise, enchanting. They offered truly glorious sound, and seemed to build gradually and progressively to the climax of that final sonata which reached the level of sublimity for me, and I was not alone. Full disclosure: I arrived late, missing the first sonata and all but two of the Bagatelles, to my frustrated regret. The piano we heard is not from the time of Beethoven and Schubert but rather a very modern one, made in this new century; it is also not an exact replica of a specific early 19th-century instrument. Instead, it was designed in 1999 by its maker, Rodney Regier of Freeport, Maine, and crafted using materials and mechanisms similar to those used by the makers of that time. He studied harpsichord and fortepiano building in the workshops of Boston harpsichord builder William Dowd and in others in England. The example we heard includes features employed by two Viennese makers who were Beethoven and Schubert’s contemporaries, Gonrad Graf and Ignaz Bösendorfer. Depicted [here], it is affectionately called by some a Grafendorfer, and evokes models made around 1830. Its pitch is a1 = 430 Hz, it has 80 keys, with a white ash and Douglas fir frame (no metal involved) and a stunningly beautiful mahogany and black walnut veneered case. It comes with four pedals, left to right: keyboard shift (= una corda, or soft), bassoon (which creates a buzzing effect by placing a piece of parchment beneath the strings below middle C), moderator (which inserts a ribbon of cloth between the hammers and the strings), and damper. It also appeared to have Janissary stop, which has a hammer to strike a small bell on the inside of the left side of the case and a mallet to strike the soundboard to imitate the drumming and jingling of Turkish military bands (some Beethoven works, though none on this program, call for this), instead of the bassoon. It is the concert grand size of 1830, about 8 feet long and weighs 410 lbs; a modern Steinway D (concert grand) is about 9 feet long and weighs about 990 lbs. The instrument’s sound is as gorgeous as its case, warm, harmonious, luminous and melodious, simply magical. It has a diversity among its registers that reveals nuances and tones that cannot be obtained on a modern instrument, and make the music come alive, revealing what must have been in Beethoven’s head as he wrote it—by the time he wrote the latest works on the program, he couldn’t actually hear it, so it is entirely possible that what the audience was hearing was in fact more luxurious than the sounds of the instruments by those makers with which he was actually familiar, because advances in the instrument were measured by the decade in the first half of the 19th-century. For those near the front, the volume was perfectly adequate in the natural acoustic, though the sound would not have carried well to the rear of the long sanctuary. The balance of the piano with the string instruments in the chamber works was more equal than with a modern piano, whose power makes it the stronger, more dominant partner, even though Beethoven clearly thought that string musician was secondary by the very order he chose in his title for the sonata. The two trio movements were new to my ears, and simply lovely; one wonders what Beethoven had in mind when he wrote them and where he might have used or incorporated them had he lived longer. Interestingly, the two works dating from 1812 are more Schubertian than the others. During an interview, Greenleaf asked the pianists when they first encountered and began playing earlier instruments and what they liked about them (All also perform on modern ones, of course.). Each reaffirmed what the others said in answer to the latter question, things such as the clarity of the sound and the responsiveness of the keys and the rapid decay that gives greater ability to control the volume. Love spoke of the ease of producing sforzandos, but some of Yeng’s comments struck me as worth repeating. She spoke of the colors that they produce and said that she hears harmonies that she never hears on a Steinway. She said that she in fact did not really like playing Beethoven until she had done so on an instrument of his time; she clearly loved what she was doing in her performance.